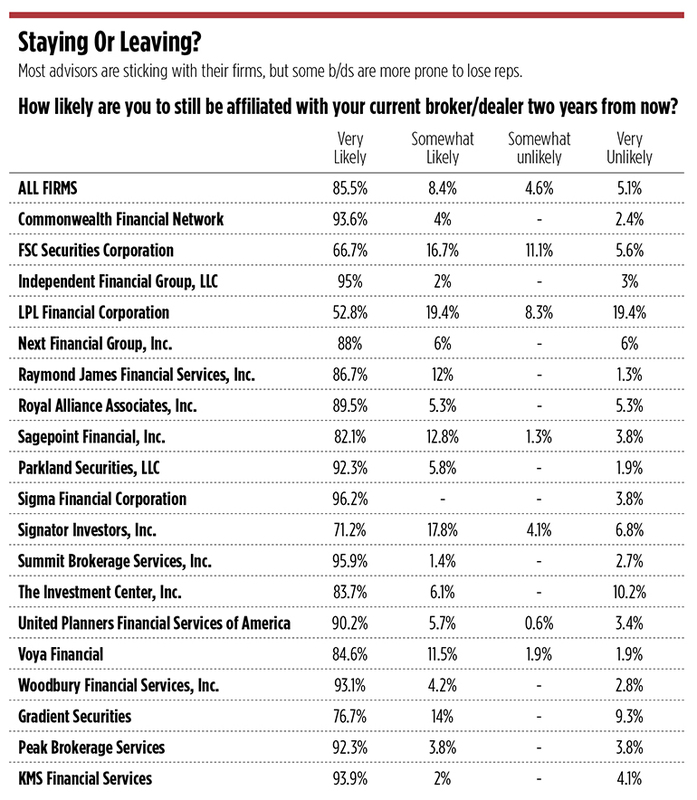 Advisors at independent brokerages across the country are largely happy where they sit, as overall satisfaction with their chosen firms ticks higher and the average book of business expands by double digits. 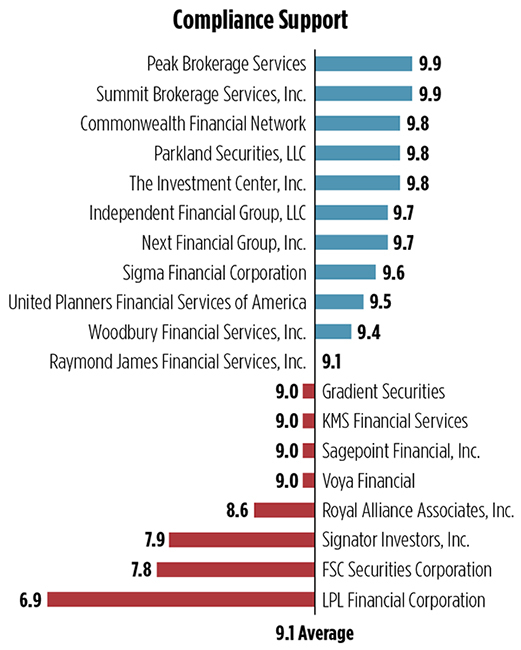 Until recently, the stock market has been good for both investors and the financial advisors who serve them. That’s the backdrop for WealthManagement’s annual Independent Broker/Dealer Report Card Survey, which finds advisors at independent broker/dealers this year more satisfied with the state of affairs at their firms, managing larger client accounts and now have over half of their revenue coming from fee-based advice business, as opposed to commissions. The S&P 500 and the Nasdaq both saw their highest annual returns since 2013, up 19 percent and 28 percent, respectively, in 2017. At the same time, advisors’ books expanded, with average assets under management up nearly 13 percent from a year ago and average annual gross production up by the same percentage. 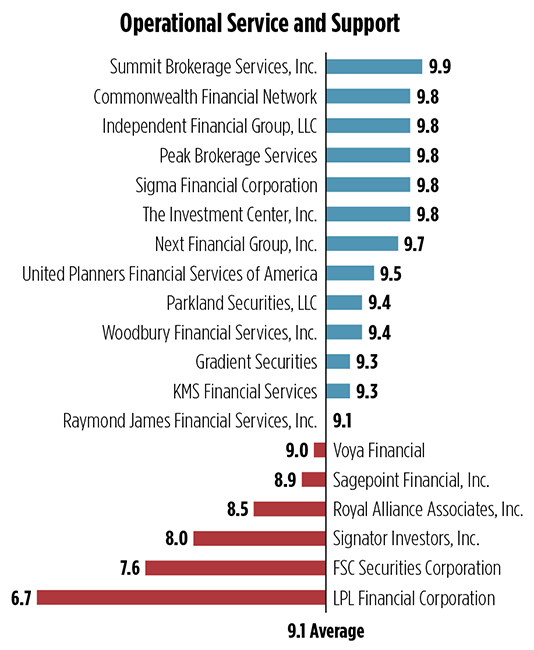 The annual survey asked advisors from independent brokerages to rate their firms, from 1 being unacceptable to 10 being outstanding. 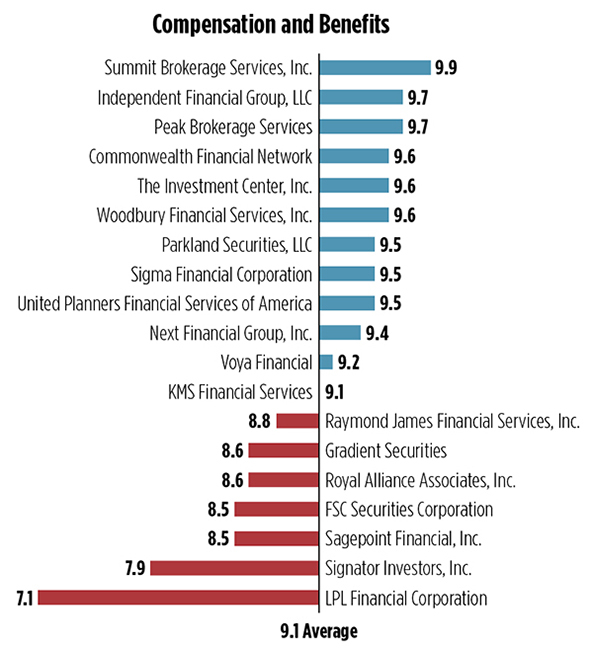 On average, advisors rated their overall experience at their firms a 9, up just a pinch from 8.96 in last year’s survey. 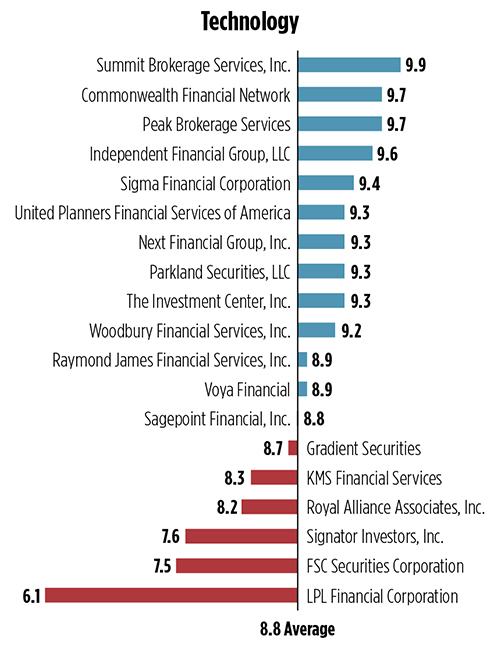 WealthManagement fielded the online survey via invitations emailed to print subscribers, online registrants and advisors in the publication’s database of IBDs. Between Feb. 15 and March 12, we received a total 1,562 responses. Only firms with more than 30 responses were included in the survey. For reporting purposes, each company is weighted equally in the overall percentages and means so that no single company is over- or under-represented. While 2017 was initially shaping up to be a year of significant change for IBDs, with the Department of Labor’s fiduciary rule set to take effect, the Trump administration set in motion a series of setbacks for the rule, including a delay of the first applicable date as well as an 18-month extension of the special “transition period.” Furthermore, the U.S. Court of Appeals for the Fifth Circuit recently struck down the rule, agreeing with the plaintiffs that the DOL overstepped its statutory boundaries. 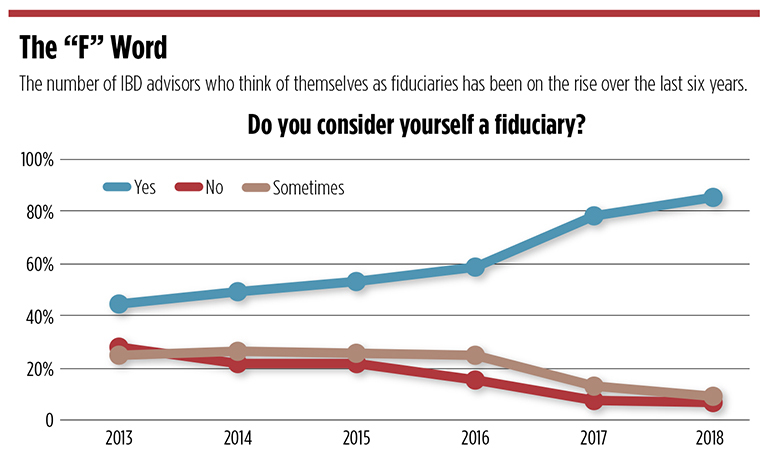 Yet, the rule’s likely death hasn’t slowed the fiduciary momentum, with 85 percent of IBD advisors saying they consider themselves fiduciaries, up from 78 percent last year. At the same time, much of their business is still transaction-based, although the mix of business continues to change. 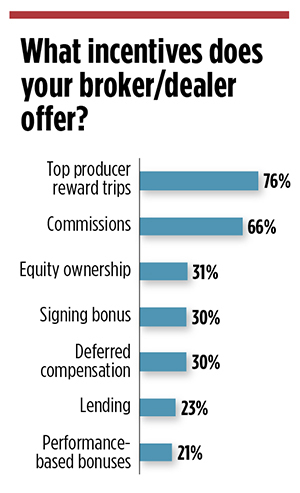 On average, 38 percent of advisors’ income came from commissions in 2017, down from about 42 percent in 2016. Asset-based fees accounted for about 54 percent of the average respondents’ income, up from 51 percent in 2016. While advisors, for the most part, are comfortable in their seats—nearly 86 percent indicate they’re very likely to still be with their current b/d in two years—scores for morale and brand/public image declined from last year. 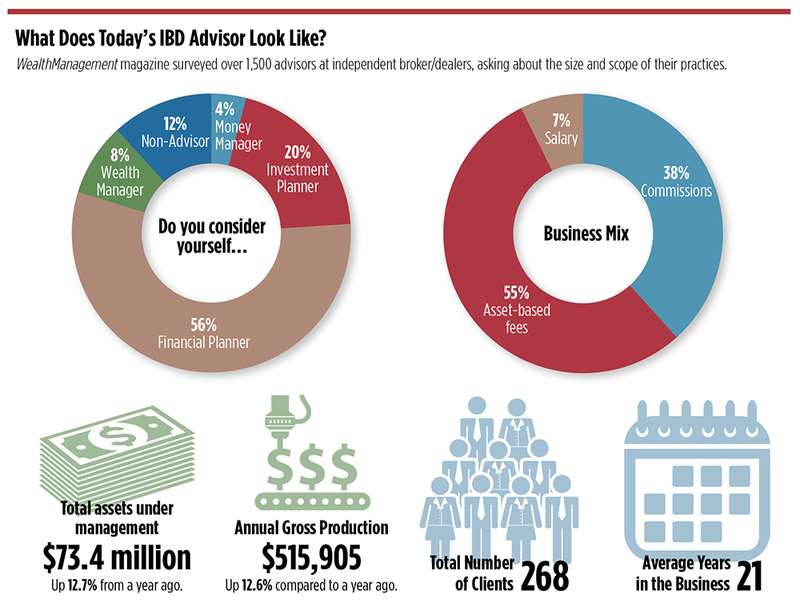 Advisors are feeling confident they control their own destiny when it comes to the b/d relationship. When asked what would make them leave their current firm, the top answers were: a firm being unresponsive to the advisor’s needs; a disagreement over the direction of the firm; or too much interference in their business. Advisors rate their experience with their firms across key service areas, with 1 being unacceptable and 10 being outstanding.